Snippets of Jack: "Perhaps his usefulness has run its course." "Perhaps his usefulness has run its course." 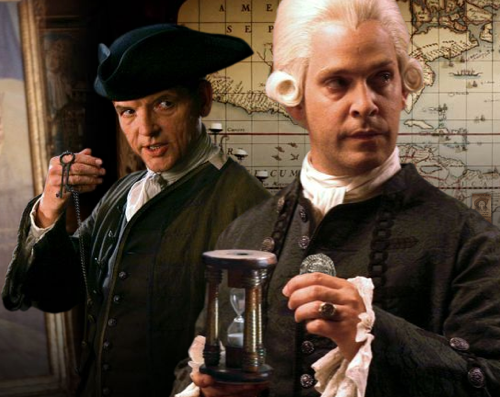 I thought it would be nice to stick with the theme of short, evil, British merchants, which means this will be another post about Cutler Beckett. 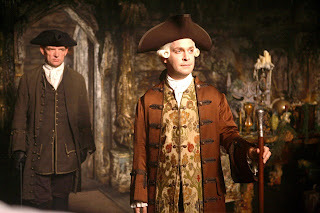 This time, he is a Lord, seeking more power and wealth in the company, like we previously described in our last post. So he has the heart of Davy Jones, which to him means taht he controls the seas. Now, considering the oceans make up like 3/4 of the earth, I guess you could say he almost has control of the whole world. Except, Davy Jones' hasn't quite gotten used to taking orders yet. Beckett finds this out when he comes upon a ship, completely destroyed and set on fire. Beckett: "Bloody hell. There's nothing left." Mercer: "Jones is a loose cannon, sir." Beckett: "Fetch the chest." Beckett has such a cold voice, it feels like everything he says is a cool death threat. Mercer: "And the governor?" Mercer is concerned about Elizabeth's father, Governor Weatherby Swann. Not concerned like worried about him, but concerned as him he may ask too many questions and ruin the plan. Mercer: 'He's been asking questions about the heart." Beckett: "Does he know?" Know that you plan to use it to end piracy once and for all? It's rather funny that the pirate Beckett hates the most (Christophe) was killed by Jack Sparrow, who he also hates. I wonder if Jack and Beckett know that they even have this mutual enemy. Probably could have saved some conflict. Mercer gives him some look that doesn't really communicate anything to me, but I guess Beckett got the message. Beckett: 'Then perhaps his usefulness has run its course." Key dramatic and menacing organ music. Next thing you see is Governor Swann in a long boat next to Mercer (with his black gloves) and a bunch of other men. There is debris on fire all around them, a little gift from Jones. The Governor has cloth above his mouth to stop from breathing in the smoke. It makes me very sad to think about what they are going to do to him. Then we find that its actually Davy Jones demonstrating hims musical abilities, as he is playing the organ with is tentacles, which is both gross and cool. There is also music coming from the little heart music box that he and Calypso both have. He holds it up and stares into it sadly, clearly yearning for the romance he and the sea goddess used to have. The music stops and he actually sheds a tear! He captures this with his tentacle and stares at it. Suddenly he is reminded that his heart broken, lonely, and rejected, which of course makes him really mad at the woman who did it to him: Calypso. He just shakes violently in anger, kinda creepy. His little pity session is interrupted. Beckett has ordered all his men onto the Flying Dutchman, including the always loved, James Norrington and the two idiots Murttog and Mullroy. Norrington: "Steady men." 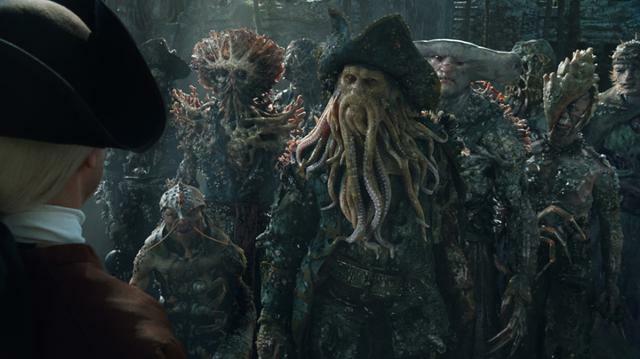 Davy Jones doesn't really like such a distraction on his ship. Some men then bring out the chest with the heart in it. Jones: "Go. All of you. And take that infernal thing with you. I will not have it on my ship!" That's weird because the infernal thing is your heart, which used to be in your chest, but now you don't even want it on your boat. Quite strange. Beckett then makes his appearance. Beckett: 'Oh, I"m sorry to hear that . . . because I will. Because it seems to be the only way to ensure that this ship do as directed by the company. We need prisoners to interrogate, which tends to work best when they're alive." Governor Swann comes out next. Jones: "The Dutchman sails as its captain commands." Beckett: "And its captain is to sail as commanded. I would have thought you'd learned that when I ordered you to kill your pet. This is no longer your world, Jones. The immaterial has become . . . immaterial," Please oh please oh please tell me that one of you my many readers know what this means! Because I honestly can't figure it out. This and the "Currency is the currency of the realm" makes no sense! Oi. So they set up the heart in Jones' organ room surrounded by armed soldiers. Beckett just thought he'd rub it in, typical Beckett. He's some what of a bully. I wonder if he knows that Jones also helped convict Christophe of rouge piracy. It's a small word, eh? I you still don't know what the immaterial line means. It means the supernatural like Davy Jones and abstract ideas like freedom (what the pirates represent in the movie) are no longer relevant because EITC is taking everything over. Also, jones is heartbroken because the heart is on the ship, otherwise he wouldn't have had enough emotion to cry.